Broccoli died today. He was 1.5 years old, which in goldfish years is about 38. Greg won him at the Fairfield County Fair in October of 2006. The game consists of me buying ten dollars worth of ping pong balls and Greg trying to throw them into small fishbowls of water. He made one in at the two dollar mark and my biggest fear was that he would make another one or more. Luckily he only made the one and the carney dipped a random, non-floating goldfish out of the fish vat and put him lovingly into a plastic bag. As we walked to the car, me holding the plastic bag with him wanting to, I asked Greg what he wanted to name his new pet. Without much hesitation, he said, “Broccoli.” I made mention and repeated several times that goldfish get sick and die. Greg seemed to not care. My old boss Orlando suggested I buy the SpongeBob SquarePants all-in-one tank. It came with everything a fish that was only going to live a month needed: Tank, air bubbler, tiny white rocks, and SpongeBob character to stick in the tank as your fish would need a friend to console it during its short life. About six amazing months into his life, Broccoli began to act funny. He’d spin. All the time. Most of the time he would spin with his nose pointed at the tiny white rocks in the bottom of the tank. When we would feed him, he’d spin up to the surface and spend hours trying to get the food to go in his mouth. The internet said it was a parasite that fish get and there was no cure. I let him spin for about two days, hoping he would work it out. I told Miss Sally that I would give it one more day before sending Broccoli to the porcelain purgatory. The next day, he was fine. No spinning. For weeks, I would quietly ask Sally if she replaced the sick Broccoli with a new Broccoli. She denied it. I believe her. Mostly. A year after Broccoli became a member of our family, Greg and I went back to the Fairfield County Fair and we won another goldfish. This time I only bought two dollars worth of balls and Greg’s aim was still the same. As we walked to the car, he holding the plastic bag with me wanting to, I asked Greg what he wanted to name his new pet. Without much hesitation, he said, “Broccoli.” “But you all ready have a fish named Broccoli.” He shrugged. 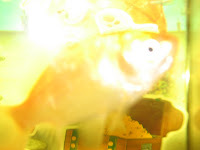 I made mention and repeated several times that goldfish get sick and die. Greg seemed to not care. I made a point to not differentiate between the two Broccolis. I’d comment, “Broccoli is getting bigger!” or “I like Broccoli better.” Greg would answer whichever way he’d see fit. Today, Broccoli was hovering sideways in the middle of the tank. I tried to resuscitate him by pushing him around in a bowl of water, forcing water through his gills. He was gone. I called Sally and asked her what her opinion was on sharing the death of Broccoli with Greg. She said I should and we should flush him together. I called Greg in from the outside. I held him up to the bowl I tried to resuscitate him in. I said we had to flush him and we took him to the toilet. Luckily Miss Sally had just cleaned the bathroom or I would have felt a little guilty throwing him in a five year old’s pee shrouded toilet. We dropped him in and I said a few words about what a good fish he was. Greg flushed. I, of course, said this out loud and Greg and I laughed, making up new lines, mimicking Broccoli. “You can’t flush me suckas!” Greg’s was, “I’m swimming in the toilet,” which he thought was pretty funny. The tank re-filled and Greg flushed again. Broccoli swims alone in his tank in Greg’s room. I reminded him to only put in half the food he did the night before. Oy. I bought my boyfriend's daughter a fish about a year ago. She took it home to her mom's house (my boyfriend's ex), the ex put the Sponge Bob tank in a window that gets sun all afternoon. Can you say" Dead Fish??!!! Argh! Oddly, I was the one who cried. The kid just wanted another fish. Go figure! Hunter eyed that very game at the fairfield fair and I feigned not having any dollars...I wish I wouldve given in mow. I had the same concerns.. Kudos to Greg for keeping Broccoli alive for so long! I once cleaned my kid's fish tank out....thinking I was doing the right thing so said fish would have nice, clean, clear environment. Welll.......no one told me that you can't use Lemon Joy to clean a fish tank. Fish perished by oxygen deprivation. Water boarding if you will. But flushing him, people really do that? Give the next one a proper burial at least. Or cremation if you have no place to dig a hole.